If you thought Jupiter’s Great Red Spot was odd, wait until you get a look at its magnetic field. New data from Juno, a NASA space probe that’s been orbiting Jupiter for the past two years, reveals that the gas giant has a field unlike that of any other planet. While Earth’s magnetic field is distributed symmetrically around the planet, Jupiter’s is much stronger in the northern hemisphere than in the south. And whereas Earth’s magnetic field lines converge rather neatly at the poles a bit like a giant bar magnet, Jupiter’s field lines look helter-skelter on a map created from the data. The lines emanating from Jupiter’s north return not to one point but to two: one near Jupiter’s south pole and the other near its equator. The scientists who conducted the research don’t expect a quick solution to the puzzle. Earth’s magnetic field is believed to result from the circulation of liquid iron in our planet’s outer core; as this electrically conductive material moves about — driven by heat from a solid inner core — it generates a “dipolar” magnetic field. 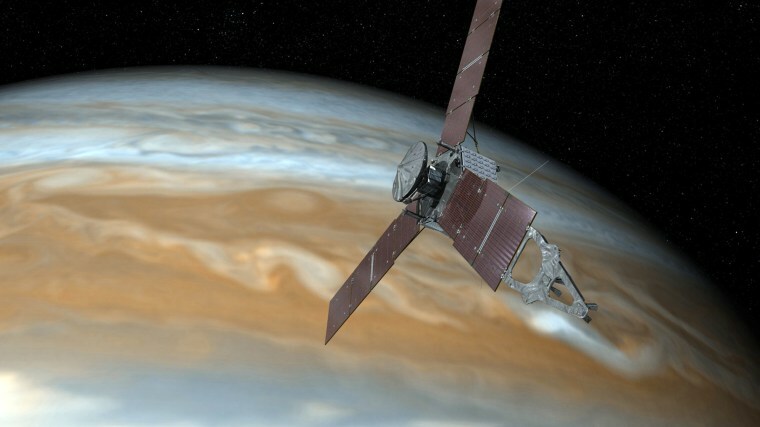 Additional data to be collected by Juno could help explain the mystery — but that will take years. The new magnetic field map is a coarse one, generated from data collected by Juno over the course of eight close passes over Jupiter’s surface as it skims the planet’s surface at speeds of up to 150,000 miles per hour. Bolton said the final, detailed map, to be made from data collected from a total of 32 passes, would be completed in 2021. It will take that long because it takes Juno 53 days to compete one orbit of Jupiter — and Juno is close enough to Jupiter to collect the necessary data for only a few hours of each orbit. Juno launched in 2011 from Cape Canaveral Air Force Station in Florida.